Crosland Southeast Breaks Ground on 83-Acre Stonebridge Development in Richmond, Va.
Richmond, VA (October 25, 2011) – Charlotte, NC-based Crosland Southeast broke ground today on Richmond MSA’s newest multi-use development, Stonebridge, which will occupy the site of the former Cloverleaf Mall in Chesterfield County. The first phase of Stonebridge includes the construction of 144,000 square feet of retail space – most notably, a 123,600 square-foot Kroger Marketplace grocery store. Stonebridge is a joint venture between Crosland Southeast and Hartford-based Hutensky Capital Partners and is being celebrated as a significant advancement in revitalizing one of the region’s popular gateways to Chesterfield County, which borders the city of Richmond on the eastern corridor of Midlothian Turnpike. This regional site boasts one of the highest traffic counts in the Richmond MSA with over 120,000 cars per day and approximately 180,000 residents within 5-miles with average household incomes exceeding $70,000. The Kroger Marketplace will be the region’s largest traditional grocery store in size and will represent the Kroger Company’s largest single-store investment in the company’s history. This first-of-its-kind store in Virginia offers shoppers an experience that combines a top-quality grocery store with 30,000 square feet of non-grocery, home store offerings ranging from furniture to home décor. The remaining square footage of the first phase of development will include a Kroger fuel station, 20,400 square feet of smaller retail shops and four (4) out parcels. Still in the planning phases, Crosland Southeast and Hutensky Capital Partners plan to commence on Phase II of Stonebridge in mid-2012. This next phase is projected to include 175,000 square feet of retail space plus approximately 350 multi-family residences. 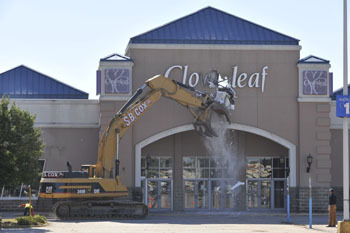 Chesterfield County purchased the Cloverleaf Mall and adjacent property in 2004 to stimulate private-sector interest in a major redevelopment that would serve as an economic catalyst. In 2006, the County offered economic incentives in the form of tax increment financing to support demolition of the mall and to provide new infrastructure. As a result, 22 national, regional and local real estate developers interviewed for the opportunity to proceed with a redevelopment plan for the 83-acre property. Crosland was selected. The project was designed by McMillan Pazdan Smith, engineered by the Timmons Group and will be constructed by HOAR Construction. Demolition will be done by S.B. Cox. The Crosland Southeast partners have been active in Richmond for the past several years having developed the 111,000 square foot Rutland Commons Shopping Center, also anchored by Kroger. With its acquisition of Crosland’s Retail Development Company in 2011, Crosland Southeast and its partners have a long history of developing and leasing award winning retail and mixed- and multi-use developments throughout seven southeastern states. The Crosland Southeast founding partners previously served as officers of the 74-year old Crosland legacy company, Crosland LLC, and have a combined 110 years experience in the shopping center industry. During their tenure at Crosland, they have successfully developed over 10 million square feet of commercial space. Notable projects include Biltmore Park in Asheville, N.C., Blakeney and Birkdale Village in Charlotte, N.C., Providence Marketplace in Nashville, Tenn., and The Shops at Greenridge in Greenville, S.C. Through their leadership, Crosland earned a reputation as being one of the leading retail development companies in the Southeast United States. Editor’s Note: Click http://docs.yellowduckmarketing.com/Stonebridge_Elevation.jpg for a rendering or http://docs.yellowduckmarketing.com/Stonebridge_Site_Rendering.jpg for a site plan of the shop space. 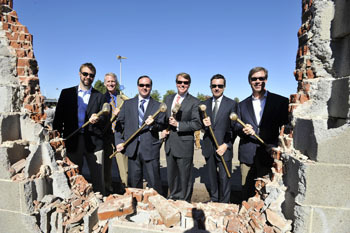 If you would like photos of the demolition or ceremony, please email julianne@yellowduckmarketing.com.